One of the Nameless Ghouls of Ghost says he understands why other acts are tempted to keep going long after they should have split – but insists his band won’t make the same mistake. Members have previously discussed the longevity of the band, and the concept of whether to continue making music once their identities have been revealed. They were recently the subject of an online petition to force them to quit. Now a Ghoul tells TNG: “There are a lot of bands that just keep existing – and I don’t blame people. There are bands that have existed for 10, 15, 30 years that just keep going. They do it because they have to, for monetary reasons. They have to live. 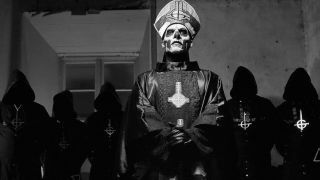 It’s one of the reasons Ghost won’t keep going after their sell-by date: “We’re rational enough to feel when the curtain is falling, that we have nothing more to offer — what we’re doing is just a repeat,” he says.